We’re pretty poor at keeping track of the days of the week. Back in our working lives a Sunday was an opportunity to relax and recharge the batteries. Maybe we would have a lie in and a lazy morning. Possibly we would have a big brunch to treat ourselves, maybe we would cook a roast dinner or something that takes a bit of time and loving attention to prepare. In between I might potter in the garden, or we might take a stroll down to the beach. The whole day would be spent at a slow pace, gathering energy for the week to come. These days it might feel like a Sunday, we might deliberately slow down and relax, but it could be any old day of the week. Today was just a coincidence. 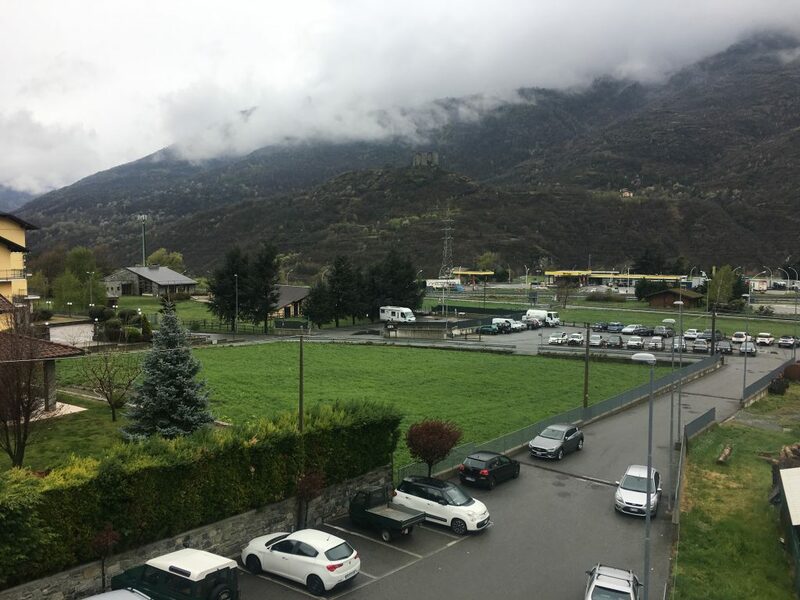 We had moved down from Cervinia to the town of Châtillon at the entrance to the valley. We have been here before and knew that motorhome parking existed, had electricity and might cost us €5. If the payment machine was in the same state as last year (and it was) then we would have a free overnight stay. It’s quite close to the motorway so there is some traffic noise here, but more the ‘low hum’ variety rather than loud zooming. The main issue with the parking spot is the access, you have to drive down a small road between a parking area and a more significant junction – it’s easy to overshoot it. You can also access it by driving down the ramp and through the Conad parking area. It had been a noisy night as a function was being held in the nearby sports hall with some booming music. We woke up late the next morning to the sound of rain drumming on the roof, more than enough to drown out any traffic noise. A peek through the windows told us it was a miserable and grey day and there was little point in rushing. We got up slowly and I decided to take the laundry and my kindle to the local self service laundrette (something else we knew about from our last visit here). It’s a short walk through the Conad supermarket car park, up the steps and over the road to the laundrette. Bertie’s parking spot seen from the steps above the Conad supermarket. I had a relaxing morning reading and watching the coming and going of the customers in a comfy chair in a nicely heated building. Paul had an equally relaxing morning to himself in Bertie. Once I returned and had hung our damp washing in the van (we have some sports gear we don’t like to dry in a tumble dryer – luckily it’s all quick drying stuff) we had a visit to the supermarket. Our Sunday brunch was French Toast with smoked meat (not quite bacon) and honey – yum. The rest of the day was spent in equally restful ways. We decided to stay in our convenient parking spot for another evening before moving on to our next skiing destination. We were feeling too lazy and Sunday-ish to move on.